Today we went to five wineries. The wineries were so gorgeous. They were mostly on hillsides with fabulous views. We took snacks and had a picnic at Sokol Blosser vineyard. We just got back home and plan to go back out to eat pizza at a local pizzeria tonight. Yum! Yesterday, Holly and I found a sweet little market that made homemade pies. We bought a forest berry pie. We had to wait for it to come out of the oven. It was to die for! We came home from dinner at Recipe restaurant and had a slice. Dinner was yummy and reasonably priced. We are thinking of going into Portland tomorrow. We have had great weather the last two days but I think rain is in our future. I'm sure we will still have fun. Wish us luck. 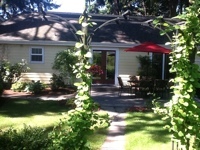 Here's a photo of the house we are staying at in Oregon. Hi! I'm in sunny (currently) Oregon! I am trying out a blogger app for my iPad so please bear with me. I am going to be so excited if this works because I usually can't blog with my iPad. We are staying in a beautiful house in Newberg. Yesterday it rained off and on but it wasn't that bad. We had a nice day. We went out to eat lunch at Tina's restaurant which was yummy. Then we went to two wineries. The first one was Argyle. They are one of the few wineries that do sparkling wine. They were lovely, the wine was lovely and so was the tasting room. Next we went Ponzi winery They had some nice Pinot Blanc and Pinot noir. We did some shopping and then went back home and watched the basketball finals. We are for the Thunder and unfortunately they lost the game. Boo. We grilled steaks for dinner. Today it is sunny and we have been enjoying our coffee outside this morning. I think today will be a relaxing day. Not sure of our plans yet but we do plan to go out to dinner tonight. If this works, I will try to post a bit of a travel blog this week. Okay, I'm off now to get more coffee. Just a short post to say hi! HI! I'm busy getting things ready before I go on vacation with my hubby. My brother just flew in this morning to stay with our kids while we are gone to Oregon. The kids were so excited to see him!! They really miss him when he isn't around. He brought my daughter a hat that my mother crocheted and when my daughter saw it she said, "It's perfect!". So sweet! I thought I would share a photo of her with it on. Her brother wanted to get in on the action so here is a photo of the two of them. I will have a post or two scheduled for while I am gone. And I might even get another one up here before I go. 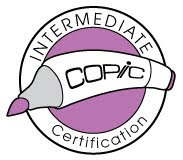 I am taking the Copic Intermediate class tomorrow and it lasts ALL DAY. Starts at 9am and ends at 8pm. Phew! All day coloring....sounds like a fun day right?! Can't wait. Sunday is my son, Jesse's, 12th birthday. We are having a pool party for him and today I am taking all the kids to Chuck E Cheeses. Which is a little family tradition that they still like to do. So busy, busy, busy this weekend. Just a few reminders for all of those faithful friends who like to help a sister out. Please be sure and make a project for the Crafter's Companion USA Challenge blog's June Sunshine/Yellow challenge. The challenge ends June 30th. 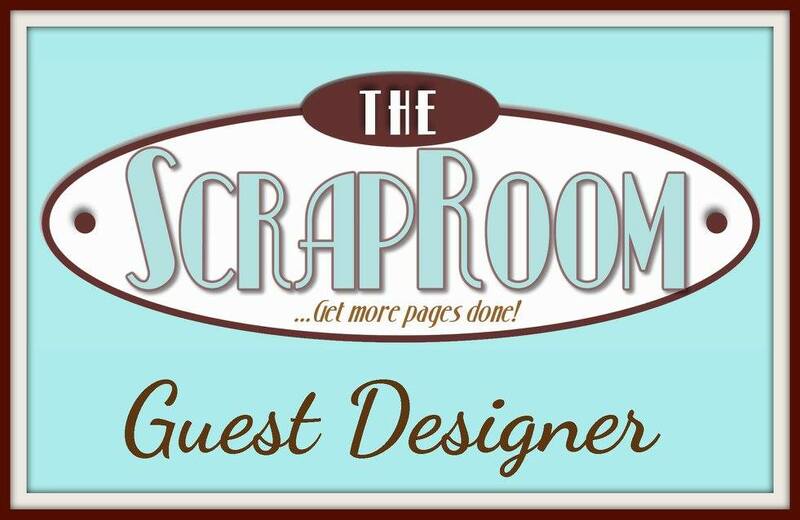 The winner will get a $30 gift card to the Crafter's Companion Store!! All you have to do is use a CC stamp and the Yellow/Sunshine theme on any type of project. Easy peasy. And remember that the Crafter's Companion Informational blog and the Crafter's Companion USA Challenge Blog each give away a free stamp set each week. So don't miss out on trying to win them!! I was so happy that I was able to get to post another project over at Crafter's Companion using the Meadow Cottage Bears stamp collection from Christine Haworth. I adore her art work and her drawings of these beautiful bears are no exception! They are just so soft and romantic. I decided to work with the With Love stamp set this time. First I stamped out the image and colored it with my Spectrum Noir markers. I love stamping onto the Ultra Smooth Premium White Card stock for Alcohol Markers that we carry in the Crafter's Companion store because it is just perfect for these markers. I've tried several different papers and this paper is the best. Coloring is smooth, blending is wonderful and no bleeding! Next I decided to make a Gatefold card. 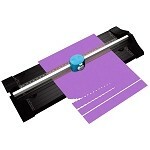 I pulled out my Ultimate Tool and two seconds later my folds were creased and I was ready to go. All I did was start with a piece of card stock 6" x 11". I butted the 6" side up to the end with the handle and scored along the Gatefold US Letter line. I turned the paper 180 degrees and did it again. Then I folded and burnished the scored lines. I now have a perfect gatefold base card. All I need to do is embellish it. So that is what I did next, I embellished it. I layered some patterned paper into a pleasing design that followed the sketch #157 challenge at Sweet Sketch Wednesday. I adhered the paper to one side of the card front and then I opened the card and cut the paper along the edge. That gave me the perfect match to adhere to the other side of the card. Then I cut out my colored image and layered it onto patterned paper and card stock. I cut a long piece of ribbon from my stash and glued it to the back of my colored image. And then I adhered the image to half of the front of the card. This allows you to still open the card. Now you can also pull on side of the ribbon around the back of the card to meet on the front side. There you can tie the ribbon into a bow to hold the card shut. Finally to finish up the card, I distressed a flower and added a pearl to the center and glued it on the front of the card. A little Crystal Stickles added to the flowers and onto the Bear's foot gives a little sparkle. I stamped and trimmed my sentiment and then added it to some patterned paper on the inside of the card. And there you have it, my card is done. 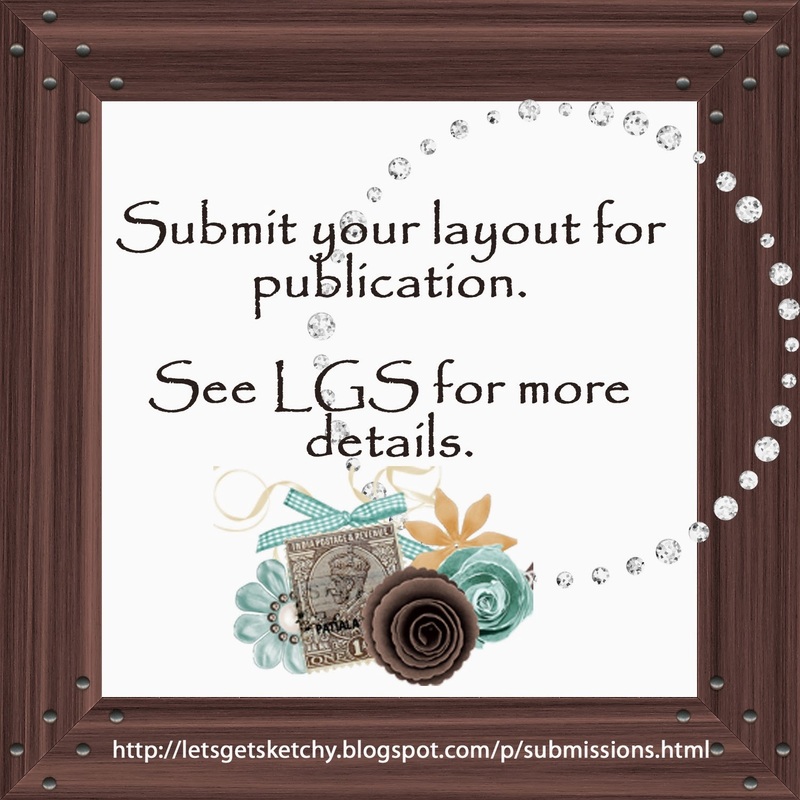 I made a layout for the June Sketch challenge at Sketches4all that I will share with you as soon as I add the photos. I used some of my new Teresa Collins paper and embellies...yum! Totally gorgeous stuff. I'm sad that Denise and her family are going home today. It was so fun having them here visiting. I will really miss them. We have been so busy having fun that I haven't had time to stop and write anything. Friday we took the kids to see Madagascar 2. Great movie!! Super cute. Then we took them to Bounce U which is a bounce house place and then after that it was back home for a BBQ and swimming in the pool. Then yesterday, Denise and I had a "girl day". We started out by having lunch out at a local Mexican food place. Then we hit the local scrapbook stores and bought a few goodies to play with when we had a chance. We finished up our "girl day" by going to see a movie, Snow White and the Huntsman. Not really the best movie because it was slow and all Snow White did was cry the whole movie but we wanted to see it and and we got to. I wanted to see Prometheus but Denise said NO! Scaredy cat!! We came home and the guys had grilled burgers for us all. Then the guys watched hockey and we went in my scrap room and scrapped and watched a couple of movies. I made a card from a sketch challenge that Fia has on Sketches4all. I used some gorgeous paper from Graphic 45 - A Ladies Diary Collection. And I got this cool wooden bird flourish from Kaisercraft that I colored with a Tim Holtz watercolor marker. I pulled ribbon and pearls from my stash and I used my new stamps from CTMH for the sentiment. Today Denise talked me into working on a sketch challenge from Skissedilla blog. Here is what I came up with today. I used some paper from the same collection as the card, Graphic 45 - A Ladies Diary Collection. Then I added some Tim Holtz distress ink drops. I swirled a round container in it and made circles. I put some on a paint brush and flicked it on the paper for some splatters. Next I pulled out a Dylusions stencil and a TH Distress in pad. I just randomly placed the dots around the page and rubbed the ink over the stencil. I pulled some cardboard, a doily, a vellum envelope, a metal clock face and a roll of flowers from my stash. I distressed them with Distress ink and started layering things. I decided to print my photos in sepia so that they would go better with the distress feel of the layout. The photos are of my dad (but you couldn't guess that! LOL). We don't get a lot of photos of him and he usually isn't smiling so it was nice to get these. I made a little journaling card for inside the envelope. I like how it turned out. How about you?? Now we are going to feed the kids and go swimming. Then hopefully more scrapping after that so expect another post soon. Hope you weekend is going great too!! Happy Thursday!! Today is the last day of school for the last 4 of my kids!! (the little one's last day was yesterday) Woo hoo!! They all get out early and will be home before noon. My bff, Denise and her family are coming to stay for the next few days and I am sooooooo excited!! Unfortunately they don't get here until this evening. So I am doing all the last minute stuff like; pick up and put away, grocery shop, take dogs to the groomer etc. I love the patterned paper I used but can't for the life of me remember who makes it. I'm sorry, my mind is blanking on it. I did use some stickers from Echo Park - Be Mine collection. I had the doilies, flowers and bling in my stash. My friend, Carri at DoubleClick aka Abusybee - recently gave me the pretty pink buttons. Love them! She sent me all sort of sweet pink goodies. It seems so quiet over on the Crafter's Companion USA Challenge blog after the May Customer Appreciation giveaways last month but there is a stamp set giveaway going on this week that ends today at 8pm pst that you can get in on if you are a US resident. And we did start a new Sunshine/Yellow challenge that we would love to see your project entered in. Check it out HERE. Go check them both out!! Okay, I have things to do so I will end here. Have a great day!! Welcome to June!! Can you believe it is already June?!! Look what I made for my child's teacher. It is that time of year again...the end of school. I always try to come up with something special for my children to give to their teachers to show how much we appreciate them. As you probably already know I have 5 kids and so that can add up pretty quickly. So I decided to recycle a box I had around the house. I re-covered it with some fun, brightly colored papers and added a ribbon from my stash. I stamped out a vase of flowers from the French 50's Cafe set from Sheena Douglass' - A Little Bit Scenic collection. I figure what is more perfect to give to your teacher than some flowers - right? I colored the image with my awesome, ridiculously reasonably priced Spectrum Noir markers. And then I cut a piece of coordinating card stock and the image out with some dies. I layered them and then attached them to the lid of the box and then topped it off with a yellow flower. I filled the box with some chocolates and then to take it over the top a bit, I made a gift card holder out of a mini paper bag. I used some matching patterned papers and ribbon to decorate it. I stamped out "thank you" in the corner. I found a fun "chalkboard" tag in my stash and layered a fussy cut apple and button onto it and adhered it to the bag. I pulled out one of the cute little clothes pins I have in my stash and went over one side of it with some Versamark ink, then I added some Stampendous Red Dragon embossing powder and heat set it. I wanted it to be sparkly red and it is!! Last day of school is Thursday. My BFF and her family are coming on Thursday to visit for a nice long weekend!! Then they leave and my aunt and uncle and some cousins are supposed to arrive the same day and stay for a week. Then it is my son's birthday. Next I go on vacation with my hubby and another couple to Oregon and then back home and immediately get in my RV and drive to Oklahoma with 3 of my kids, 3 dogs, a bird and a bunch of stuff!! Phew! This month is going to rush by. Is your month going to be busy too?? I am hoping to get a bunch of scrapping done this next weekend while Denise is here visiting to help tide you all over whenever I am gone this month. I can't wait to scrap with her!! So nice to get to scrap together. You guys know how much I love Crafter's Companion and how much I am trying to grow the Challenge blog so I hope you can find time in your busy schedule to join in on this month's Sunshine/Yellow challenge on the Crafter's Companion Challenge blog. You could be the lucky winner of a $30 gift card to our online store!! I think it turned out cute but this new Sheena Douglass - A Little Bit Scenic - French 50's Cafe Stamp was just too popular with the other Crafter's Companion USA Challenge blog DT girls. And you can see why it would be. It is super fun. 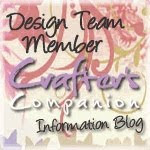 Go check out their projects using it on the Crafter's Companion USA Challenge Blog. There is a new June Sunshine/Yellow challenge posted today!! The winner is Caroline - Canadian Liner!! Hi Stacy, I will be spending time this summer at our cottage in beautiful Prince Edward Island, Canada. Great photo-ops, so I can scrapbook the pictures all winter and dream of "the Island!" 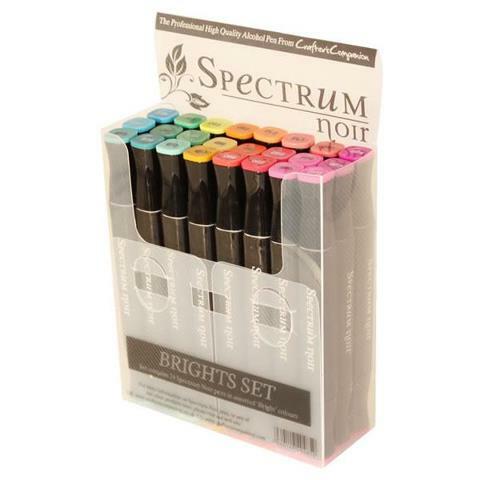 I have heard Spectrum Noir pens are a great alternative to Copics. what do you think? Congrats Caroline! 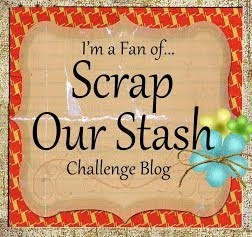 Please email your full name and mailing address to me at Scrapwithstacy(@)gmail(dot)com. You must contact me with this information by Friday, June 8th or you forfeit your candy. I enjoyed reading all of your summer plans and I appreciate your friendship. Here's to another year of blogging!! Cheers! 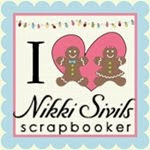 If you are stopping by to see who won my Crafter's Companion Customer Appreciation Giveaway go HERE. And if you want to know who won the Stamp Set Giveaway on the CC Challenge Blog go HERE. Pretty card and what an adorable stamp!! Congratulations Michelle!! 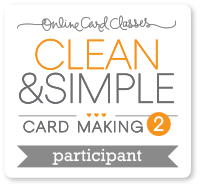 Please email your full name, mailing address and prize won (mention you won it here) to bindy@crafterscompanion.com. You have until June 8th to do so. After that you will forfeit your prize. Here is the card I made as my inspirational example. I used the Stamp It Australia - Hummingbird stamp. 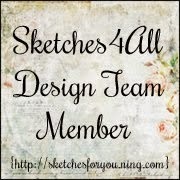 I also used a yummy sketch from Frosted Design. I actually made another card first for my DT example but so many of the DT were in love with the same stamp that I decided to make a second card. If you read my second posting today when I announce my Blogiversary giveaway winner then you will get to see it too. I actually used the same sketch challenge from Frosted Design for inspiration. Hope to see you there. Good luck if you entered! !